Introduction: Nagarjuna Dream Land Apartments, aims to enrich lives by setting new standards for customer centricity, architectural design, quality, and safety. These Residential Apartments in Hyderabad comes with a view that is unbounded and captivating. Every nook and corner of the Nagarjuna Dream Land reflects beauty in its true sense. Nagarjuna Dream Land by PNR Group Of Companies in Kompally ensures privacy and exclusivity to its residents. The ambiance of Nagarjuna Dream Land is truly a marvelous sight to behold. Nagarjuna Dream Land is one of the best investments in Residential properties in Hyderabad. The Apartments in Nagarjuna Dream Land are strategically constructed keeping in mind the best of architecture both from inside as well as outside. From stylish flooring to spacious balconies, standard kitchen size and high-quality fixtures, every little detail here gives it an attractive look. Nagarjuna Dream Land offers beautiful 3 BHK and 4 BHK Apartments in Hyderabad. The price of Apartments in Kompally is ideal for the home-buyers looking for a property in Hyderabad. Amenities: Nagarjuna Dream Land comprises of a wide array of amenities that include Landscaped Garden, Swimming Pool, Gymnasium, Play Area, Intercom, Rain Water Harvesting, Club House, Wifi, Cafeteria, Gated community, 24Hr Backup Electricity, Multi-purpose Hall and Security. Location Advantage: The address of Nagarjuna Dream Land is well suited for the ones who wants to enjoy a contemporary lifestyle with all the nearby major utilities like schools, colleges, hospitals,supermarts, parks and recreational centers. PNR Group Of Companies is an EXCELLENT builder. It has 4 on-going projects with total inventory value of Rs.2577 Cr and 6 completed Projects. 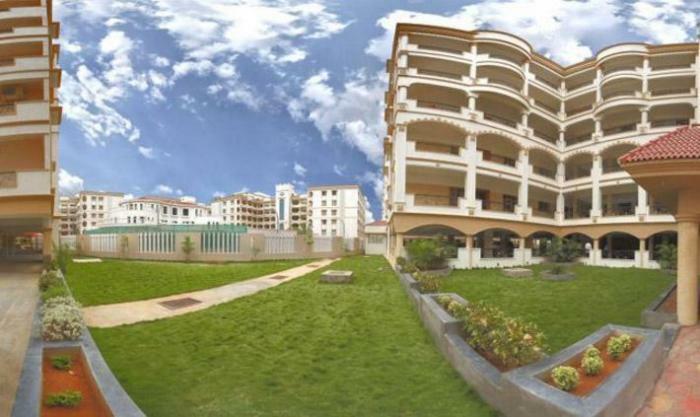 Location of this project offers decent life style and has access to Malls, Schools. But does not have access to Super Markets, Cafes. etc. It has access to Malls like The chennai shopping mall and Star Hotels like The Manohar and Parks like Jayabheri Park and Workplaces like Google and Schools like Dr KkrS Gowtham Concept School This location is recommended for people who have 24x7 help for daily needs. Standard bricks in cement mortar. Plastic emulsion with luppam finish for internal walls and exterior quality for external walls. All door frames in teak wood. Main doors shutter in teak with polish and remaining door shutter are flush shutters of standard make with enamel paint. Teak wood frame and shutters with enamel paint along with MS safety grills and glass panels. Marble flooring in living, dining, kitchen and bedrooms. Ceramic flooring in balconies. Polished granite cooking platform with sink, ceramic tile dado up to 2 feet high above platforms. Ceramic tile flooring and ceramic tile dado up to 6 feet high. Concealed plumbing with quality CP fittings. Concealed copper wiring with adequate light, power and fan points. Wiring and electrical switches of standard quality. Water supply through bore well from overhead tanks. Drainage lines, materials are of standard make. DG for stand by power for lifts, pumps and common lighting. Two spacious 8 passenger lifts. Review of Nagarjuna Dream Land, Kompally? Its price, location, builder etc. Review of Pnr Group Of Companies, Kompally? construction quality, trustworthy, delivery history etc.? Review of Nagarjuna Dream Land, Kompally location? neighbourhood, connectivity, schools etc.? Comparison of Nagarjuna Dream Land, Kompally to nearby projects? Is it rightly priced? What is your feedback on this Nagarjuna Dream Land, Kompally? Depends on brand name and complete the project in time etc? Will this be a better option for investment or to live in Nagarjuna Dream Land, Kompally? Can you give some suggestion? Is the Nagarjuna Dream Land, Kompally has more potential in terms of capital appreciation, ROI, Rentals, Proximity to social infrastructure etc?